What was the first craft brew you ever tried? What did you think? First was probably a beer by Gritty McDuff’s in Portland, ME. Their Best Bitter I think? As I recall, I was enlightened. Never looked back. Do you homebrew? If yes, favorite homebrew to date: I do! Favorite to date is probably the Mango Hefe brewed this summer. Still trying to brew a IPA hoppy enough for my palate! How’d you hear about the pdxbeergeeks? Through mutual friends and Facebook. What does being a beer geek mean to you? Well, for me, to “geek out” is to fully immerse yourself in a subject and to become an authority on that subject. 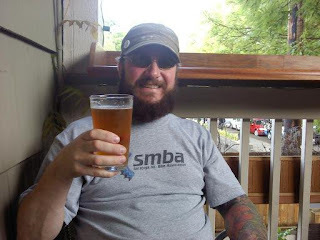 I love the beer scene in Portland and hope to become as involved as I can in it on all levels! If you could change one thing about beer culture in the US, what would it be? I think we’ve come a long way since Jimmy Carter righted the terrible wrong, but there’s work to be done still. I think my mission would to be to educate the general beer drinking public on the many styles of beer that are available and the quality of the beers being produced today. If people want to drink a pilsner, there are better ones out there than what the mega-breweries are producing.